I love Christmas songs, carols, holiday songs! I do, however, have a pet peeve about hearing Christmas songs before Thanksgiving is over. I just don’t want to hear them until the day after Thanksgiving. It may be just me… like I said it’s a pet peeve. 5. 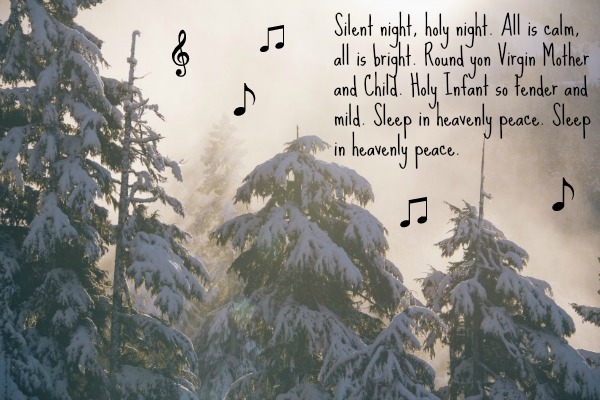 Silent Night – This version by Pentatonix is beautiful and somewhat haunting. Breathtaking, really. 4. Hallelujah – I could listen to this version over and over again. Beautiful. 3. Mary, Did You Know? – Sung by Pentatonix (I know, I really love Pentatonix… and they sing Christmas songs beautifully) is absolutely stunning! 2. Do You Hear What I Hear – I love this song and this version sung by Frozen singer Idina Menzel, is beautiful. 1. The Little Drummer Boy – is my favorite Christmas song from my childhood. I’ve always loved it and this version by David Bowie and Bing Crosby is just beautiful. If you’ve never heard it before or it’s been years since you’ve listened to this version – take a listen, you’ll be glad you did. I will be listening to and singing Christmas songs all day, every day from now until Christmas night! I hope you enjoy my favorite Holiday songs and I would love to hear yours. I love Christmas Canon by TSO. Such a fun post. I love Christmas songs. Ahh I love the Little Drummer Boy song. That song gets me everytime! Yes, Silent Night is my favorite Christmas song of all time!! My all time fave Christmas song is O Holy Night. I love quite a few Christmas songs. Pretty much anything Josh Groban sings is a favorite. I also love the traditional ones. I am less fond of the “santa” songs. I like the ones that praise Jesus. Love “Mary did you know”. One of my favorites is “Last Christmas,” but I love listening to Christmas music all season-long. It gets me in the spirit of the holidays! My favorite is “One King” I don’t know if it’s a well known song, but I just love the melody, harmonics and words of it. Any Christmas song from Michael Buble is my favorite. I adore his Christmas album also. It’s quickly become a classic here. I’m loving the Idina Menzel Christmas album for sure. I love Christmas music and I must say Pentatonix is a new fav of mine. I saw them win on the singoff. I know what you mean. Thanksgiving wasn’t even over when I started to hear people play Christmas songs. I love Mary, Did you know? by Pentatonix. So beautiful. I wait until December 1st to play Christmas music while I decorate my house. I love Christmas cannon by Tran-Siberian Orchestra. Your choices are awesome! I also love White Christmas and It’s the most Wonderful Time of the Year. I listened to them all the way to Michigan when I was driving. 16 hours of Christmas carols! i love the classic version of silent night! I’m not really into many of the songs during the season. I’m happy with peppy mainstream pop, R&B, and 90s. Michael Buble is my favorite singer to listen to on Christmas. The singers you’ve featured have lovely voices too. who could argue such a great list, i’d throw in ‘frank sinatra’s x-mas’ cd. My favorite Christmas song is Angels We Have Heard On High. I am glad we only listen to holiday carols for a short time each year.